Preheat grill (or pan) to medium-high heat. 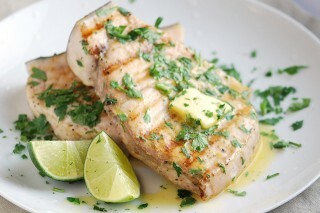 Brush both sides of the swordfish steaks with olive oil then sprinkle salt, pepper and ground coriander on each side. Grill the steaks until cooked through, about 3-4 minutes on each side, depending on the thickness of the steaks. Remove the steaks and top with a dab of room temperature butter, coarsely chopped cilantro leaves and a spritz of lime juice.